Give the gift of health with the NutriBullet LEAN System & Free LEAN Boost. During the holiday season, we all tend to over indulge in things. And who could blame us? There are all the parties, family and friends visiting and all wonderful food. We also know the new year is right around the corner and with that comes the resolutions of a lifestyle change. The NutriBullet LEAN System & Free LEAN Boost makes it easy to make those changes. NutriBullet LEAN is the world’s first Precision Nutrient Extractor and body transformation plan with the power to unlock the Weight Loss Code found in everyday foods. The NutriBullet LEAN System & Free LEAN Boost comes with everything you need to start a successful year of improved health and fitness. It's a wonderful time to give this gift to yourself or someone you love. High Torque Power Base– With 1200 Watts of pure extraction power and new pulse technology – transforming the right foods in the right combinations into extraordinary nutrition has never been easier! 7 Day Transformation Plan– Learn how to eat exactly the right foods, in the right portions at the right times. This program also includes instructions on how to operate your NutriBullet LEAN to make perfect, delicious LEAN Blasts and Portion Perfect Meals. Plus, you’ll find the recipes, shopping lists, tips, and tricks you need to become the leanest, healthiest you possible! LEAN Boost– This premium blend of protein, fiber, prebiotics and metabolism boosters is designed to optimize your weight loss potential. The flavorful formula features ingredients that promote satiety and regularity, and naturally support optimum metabolic functioning. 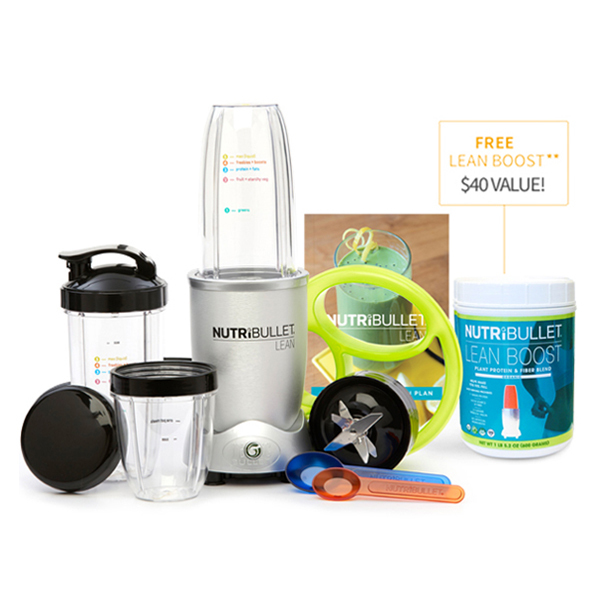 30-day supply included FREE, only when you purchase through NutriBullet. NutriBullet LEAN Exctractor– This powerful blade has been redesigned specifically for NutriBullet LEAN, twisting easily onto your LEAN Blast cups to break down, pulverize, and emulsify contents. 2 Measured 32 oz LEAN Blast Cups– Let these cups serve as your ultimate LEAN Blast-building guides. Starting from the bottom, the cup shows you how to perfectly stack ingredients for optimal nutritional content. 1 Measured Short Cup– The program’s One-Pot Meals are meant to make multiple servings so you can prep them ahead of time and have quick access to a delicious, nourishing meal on the go. Healthy Fats Measuring Spoon– Healthy fats are hugely important components of your LEAN Blasts and Portion Perfect Meals. Use this spoon to measure out the right amount of oils, nuts, nut butters, and seeds. Boosts & Freebies Measuring Spoon– Boosts and freebies add flavor and exceptional nutrients to LEAN Blasts and Portion Perfect meals alike! Use for ingredients like spices, herbs, and superfood powders. Flip Top To-Go Lid– Whether enjoying breakfast on the go or fueling mid-workout, take your LEAN Blast on the run with this travel-friendly lid. Comfort Lip Ring– Attach this lip ring for comfortable, easy sipping. 2 Stay-Fresh Resealable Lids– Great for storing and transporting LEAN Blasts, One-Pot Meals, and snacks in any NutriBullet LEAN cup. 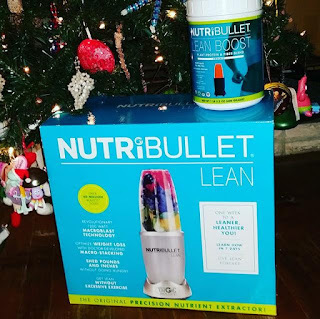 NutriBullet LEAN is the world's first Precision Nutrient Extractor and body transformation plan with the power to unlock the Weight Loss Code found in everyday foods. Teach your body how to shed pounds and inches faster just by staying in the lines. The comprehensive system includes a FREE tub of LEAN Boost, a 3-in-1 blend featuring satiating plant protein, powerful metabolism boosters, and gut healthy prebiotics. Your purchase also includes premium access to the new NutriBullet LEAN app, which makes following the plan a breeze! Use code NLMEMBER on order form to claim 10% NutriLiving member discount.